Light weight, lots of power, and low vibration makes this power cutter stand out in the crowd. Along with Husqvarna's excellent blades and water system, you'll be making cuts quickly, easily, and more safely right away. You have to figure that a company with a history that spans a few centuries makes solid products. The organizational ethos must include creating satisfied customers. Before the Husqvarna K 760 Power Cutter, the company made rifles in the 1600s, sewing machines in the 1800s, bicycles at the turn of the 20th century before turning their focus to lawn mowing and demolition robots, Husqvarna has manufactured more varied products than most. Consumers are likely most familiar with Husqvarna’s OPE equipment, but the company has long offered a deep line of construction equipment for Pros. It introduced its first power cutter in 1968 and the line is currently made of five models – three base models, two of which have an additional variation. The Husqvarna K 760 Power Cutter is a couple of years old, but this is the first time I’ve had the opportunity to use it. Coupled with Husqvarna’s Vari-Cut blades and pre-mixed fuel, this Husqvarna power cutter certainly looks like it means business. Traditionally, power cutters are known for a) being heavy and b) vibrating the living daylights out of the user. To an extent, it’s the nature of cutting through the hardest materials in construction. Tradesmen are a rough and tumble bunch, to be sure, but believe me: weight and vibration eventually take their tolls. After three decades in the business, I’m looking for a powerful tool that is also light and stable. The Husqvarna K 760 Power Cutter’s heart is a 4.48 cubic inch displacement, 5 horsepower engine with what Husqvarna calls X-Torq. This doesn’t refer to what happens when you break up with your Torq. Rather, the company claims this two-stroke engine technology provides “more accessible torque for a wider range of speeds.” It’s designed to reduce fuel consumption by 20% and emissions by 60%. Aiding the X-Torq is SmartCarb, a fuel filter compensation system. The website also lists an engine technology called DualCharge as a K 760 feature (with benefits similar to X-Torq), but there’s very little information about it online and no mention of it in the manual. ‘The starting mechanism features both Husqvarna’s Dura Starter and EasyStart technology. Dura Starter is the combination of the dust-sealed return spring and pulley bearing. EasyStart, along with the decompression valve, reduces compression during the start and pull resistance. A digital CDI ignition module fires the saw up. A Poly V-belt transfers power from the motor to blade. Like the Dura Starter, it’s completely sealed, which keeps it clean and safe. Husqvarna tells us it needs infrequent re-tensioning. For those infrequent tensioning needs, the tensioner is near the business end of the cutting arm and you can adjust it with the onboard combination spanner. Husqvarna’s Active Air Filtration single paper air filter is designed to be replaced only if power takes a dive. With its centrifugal two-step filtration, it’s supposed to be maintenance free. I’m looking forward to finding out since the only tools I have that are truly maintenance free are the ones I’ve thrown in the garbage! OSHA’s newly enacted and stringent silica dust regulations impose some onerous fines on dust-creators and their employers. That’s why the Husqvarna K 760 Power Cutter’s water system is so important. Be sure to note the location (and actually use) the water connection with the filter. A progressive water valve, or water tap as the manual calls it, allows you to adjust the amount of water released to the blade. You can limit the slurry and capture the dust before it becomes airborne. Of course, it also keeps the blade cool and extends its life. There’s enough math and sophisticated instrumentation involved in measuring vibration that the danger of passing out from explaining it all is much greater than the vibration itself. Be that as it may, it’s helpful to know that the Husqvarna K 760 Power Cutter generates 2.5 m/s2. That’s certainly toward the lower end of the scale. Because vibration exposure over time can be so harmful, you might want to check out this resource when you’re done with the review. Husqvarna points out that the handle position and short engine body allows you to stand close to the machine, resulting in greater control. So in addition to lighter weight, the Husqvarna K 760 Power Cutter’s exceptionally low vibration and handle position make the saw safer and more comfortable to use both in the short and long term. A 14-inch blade allows for a 5-inch cutting depth. There’s a reversible blade bushing for either 20mm or 25.4mm bores – an outstanding little feature. Many blades have a knockout ring that can fit either size arbor, but some metal cutting blades are one size or the other. I can’t remember seeing this reversible bushing on another saw, but it adds a lot of convenience! The blade guard is magnesium, which helps keep the Husqvarna K 760 Power Cutter at its 21.6-pound fighting weight. Inspect the blade guard every day – it’s a key safety feature. When used in conjunction with the blade brake, which quickly stops the blade’s 18,000 peripheral feet per minute speed, much of the danger of this powerful saw is reduced. 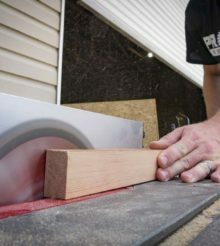 To minimize bits of airborne masonry and metal during the cut, the rear edge of the blade guard should just touch the cutting surface. It’s not always possible to put the back of the blade guard on the cutting surface, but when you can, it captures a great deal of the slush. It suppresses the sparks on metal, too. There’s just no getting around the loud noise of a tool built for cutting the hardest materials on the job. But that doesn’t mean a manufacturer can’t take pains to buffer engine noise. The Husqvarna produces 101 dB(A) at the ear. By way of comparison, that’s slightly above the Makita EK7651H 4-stroke I reviewed a while back. But that small difference is really irrelevant; with any power cutter, you’re wise to use ear protection. And for crying out loud, protect your eyes, too! At the beginning, I mentioned that power cutters have traditionally been heavy and vibratory. Well, they are also known for something else: being finicky to start. Some are hard to start when they’re cold, some don’t want to restart when they’re warm. Like a lot of us if we work well past lunch – they get temperamental. In any event, I’m happy to report that the Husqvarna K 760 Power Cutter is surprisingly easy to start, even after the honeymoon period. As any tradesman using gas-powered tools can attest, reliable starts are half the battle. No doubt that’s thanks to Husqvarna’s dust-sealed DuraStarter and EasyStart that reduces compression in the cylinder. Once it’s running, the Husqvarna shows it’s got a lot of muscle in its slim and trim, 21.2-pound profile. That’s nice if you have to hold it off the ground. Unfortunately, that’s not always the case. The Makita 4-stroke I referenced earlier is bigger and bulkier – the tradeoff for not needing to mix fuel with oil. The Husqvarna is just a sharp-looking saw. Of course, beauty is in the eye of the sawyer – and most tools look good until they do some work! And this Power Cutter did plenty of work during the course of the review: cutting a lot of stone and block for the pool area of a gigantic new home in Lakeland, Florida, cutting a floor for pipe at another job, chopping up some rebar for a block wall around a patio at yet another pool, and much more. I think most guys will admit that they dislike using the water jets for dust suppression because it gets all over the place. Of course, airborne dust endangers your health, but the slurry is just a mess. With OSHA’s new regulations and hefty fines for excessive silica dust, it’s probably wise – financially and otherwise – to defer to slurry mud on this one. At least the Husqvarna didn’t make too much of a mess thanks in part to the constant flow water tap. Just don’t put it away wet. Check out Pro mason, Dan Elms, cutting up rock on a high-end swimming pool build with Husqvarna Construction Products' K760 Power Cutter! Husqvarna’s made a solid saw with the Husqvarna K 760 Power Cutter. Coupled with the excellent Husqvarna concrete and metal blades I used, it was an exceptionally good experience. Easy and reliable starts, light and powerful in use, excellent dust capture with the water jet, and quick blade changes with reversible bushing make it a nice upgrade. These saws have come a long way from the early days and Husqvarna has done its part to move the bar higher with the K 760.